Another micro-blogging post? What’s going on here? Well, when I first did my micro-blogging post, Identi.ca had just gone public and I didn’t think there was a reason to join yet another micro-blogging service. But two things came together to convince me to check out Identi.ca. First of all, I’ve overcome my reluctance to using micro-blogging services. Second, I heard an interview on Linux Outlaws with the creator of Identi.ca. As you can see, it’s pretty much inspired by Twitter. It has a very similar interface and reply mechanisms. I got a good vibe from it – as I did with Twitter. Something about the aethetics just made me want to use it – just like Twitter and unlike Pownce. Of course, there are some negatives with Identi.ca being inspired by Twitter. Chief amongst these is the reply functionality. Only Plurk (with Pownce in a distant second) have correctly implemented replies in a way that makes sense. Without a threaded reply, it’s pretty hard to correctly follow the conversation that may come out of something posted on Twitter and Identi.ca. Of course, maybe that’s done on purpose. Perhaps replies are an afterthought because that’s not what these micro-blogging services believe micro-blogging to be about. I’d LOVE to see a mode in Identi.ca (just another tab, really) where posts could be viewed in a threaded fashion to be able to follow the conversation better. 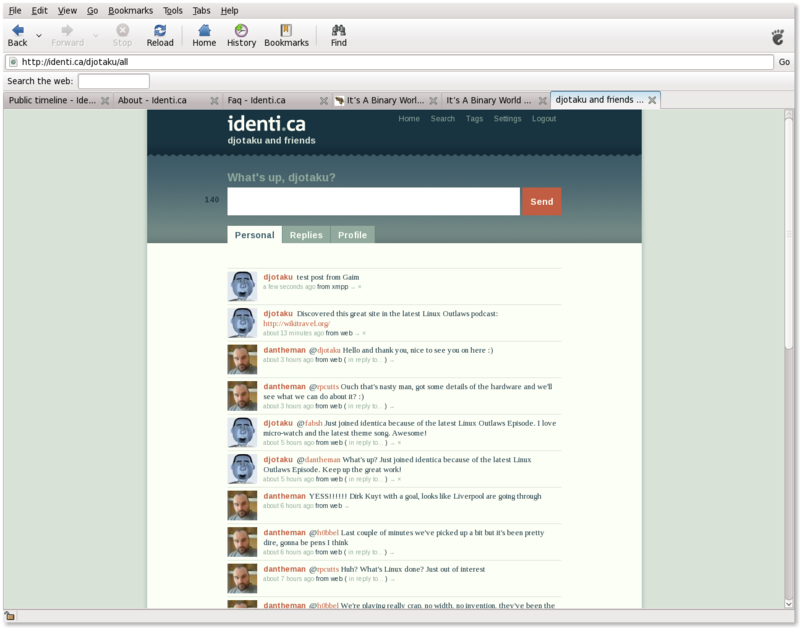 That would help Identi.ca leapfrog over Twitter in useability and functionality. Speaking of this, it appears that Identi.ca assumes the user already knows what micro-blogging is all about. Unlike Twitter and the other services, the FAQs don’t have a lot of hand-holding “this is what a micro-blog is” talk going on. I have found a lot more neat conversations on Identi.ca and I think that’s because a lot of the people on here are here because it’s open source. 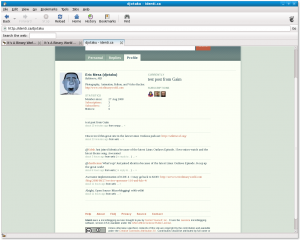 Thus, open source conversations seem to dominate on the site. So far there doesn’t appear to be functionality in Flock or any programs in the Fedora repositories that allow posting to Identi.ca from other programs. You *can* post from GTalk, though, so that works out well. What makes Identi.ca worth using, trying out, etc is that it’s open source. They are using the AGPL which means that you have to share source code if you make changes and then deploy it publicly over the web. But the most important aspect of the open-ness of this platform is that you can take the source code, install it on your own server, and then become part of the Identi.ca network. In other words, you can make your own customized version, but still have friends, communications, etc with the main site and with other sites running it. You no longer have to have an account on each of these sites, they can all just link to each other. Think of it as being able to interact with your friends who have myspace while you only use Facebook. It’s THAT revolutionary…potentially, anyway. We’ll see where it goes. I’m not sure yet what I want to do with Pownce and Plurk. 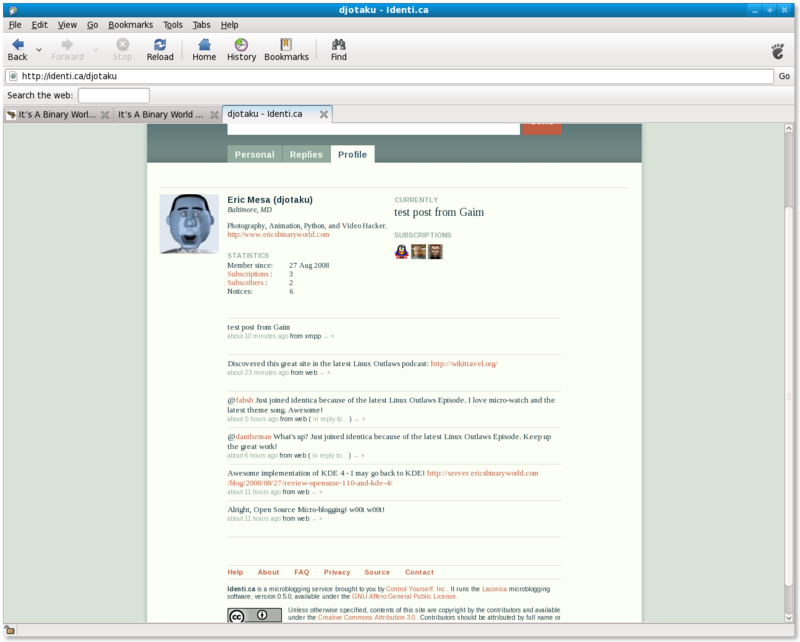 But I think Twitter will become my general thoughts blog while Identi.ca will be for Linux issues. There may be some cross-posting with issues that are really important to me, but I think this keeps my thoughts in the realms where they are most likely to be read. That’s the plan anyway, so let’s see what happens.